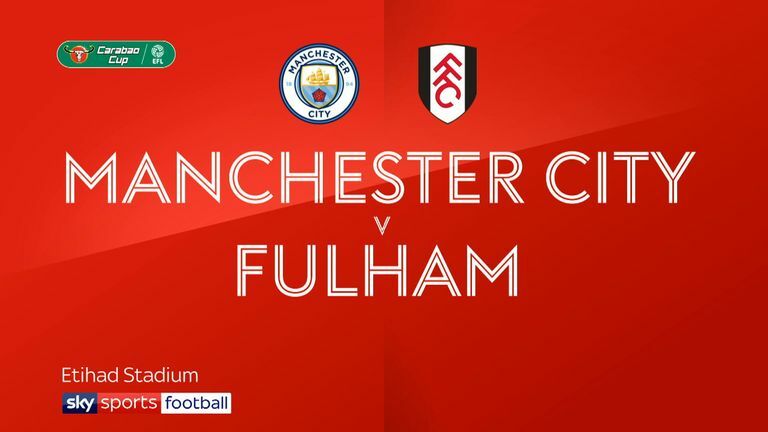 Highlights of the Carabao Cup fourth round match between Manchester City and Fulham. Brahim Diaz scored twice as Carabao Cup holders Manchester City eased into the quarter-finals after beating Fulham 2-0 at the Etihad Stadium on Thursday night. Diaz gave Pep Guardiola's side a first-half lead after his shot deflected in off Aleksandar Mitrovic (18). The 19-year-old Spaniard doubled his tally when Gabriel Jesus' shot ricocheted off the post into his path, leaving him with a simple finish (65). Man City: Muric (6), Danilo (7), Kompany (6), Stones (7), Zinchenko (7), Delph (7), Diaz (8), De Bruyne (7), Foden (8), Sane (8), Jesus (7). Subs: Mahrez (n/a), Gomes (n/a). Fulham: Rico (7), Fosu-Mensah (6), Odoi (6), Ream (5), R. Sessegnon (6), Anguissa (6), Cairney (6), Seri (6), Vietto (5), Schurrle (6), Mitrovic (6). Subs: Christie (n/a), Ayite (5), Le Marchand (6). Man of the match: Brahim Diaz. City will face either Leicester or Southampton in the quarter-finals, with that tie to be played on November 27 after it was re-arranged following the helicopter crash that claimed the life of Foxes owner Vichai Srivaddhanaprabha. Guardiola's men have conceded just once in their last nine matches in all competitions - but the one sour point of the night came in the final few minutes as Kevin De Bruyne hobbled off following a challenge from Timothy Fosu-Mensah. Fulham's poor form continues, with Slavisa Jokanovic's side having now lost five straight games, and the gulf in class was visible from the first whistle despite City's 10 changes. The lively Phil Foden forced Sergio Rico into a smart save after quarter of an hour, but the Fulham 'keeper was powerless to prevent City's opener as Diaz was fastest onto the loose ball from Vincent Kompany's knockdown and his shot diverted off the back of Mitrovic into the net. Only John Stones kept his place from the City side that beat Tottenham 1-0 on Monday. Arijanet Muric was in goal and Phil Foden also started. Danilo, Vincent Kompany and Oleksandr Zinchenko came into the defence while Fabian Delph and Brahim Diaz were selected in midfield.Kevin de Bruyne started while Leroy Sane and Gabriel Jesus completed almost wholesale changes. Tom Cairney was one of three changes to the Fulham team that was beaten 3-0 at home by Bournemouth. Andre-Frank Anguissa returned in midfield while Aboubakar Kamara was replaced by Luciano Vietto in attack. Danilo came close to doubling City's lead when his shot hit the post from an acute angle, and Leroy Sane should've done better with his sliced effort as Fulham continued to invite pressure onto themselves through poor ball retention. City missed a glorious chance to lead 2-0 at the break as Foden glanced De Bruyne's cross wide of Rico's far post in first-half stoppage time, before Jesus headed wide five minutes after the re-start as City's chances continued to flow. The hosts' second duly arrived as Sane found Jesus in space inside the box. The Brazilian managed to hold off Tim Ream only for Rico to tip his shot onto the post, but Diaz was on hand to rifle his second high into the net. Fulham only troubled after De Bruyne nobbled off after Fosu-Mensah innocuously landed on the Belgian's troublesome knee, with Mitrovic's shot from Sessegnon's cut-back deflecting wide. Pep Guardiola: "It was another good performance. They played with a lot of discipline with and without the ball. We attacked both in and outside. We could've scored more goals but it's OK.
"[De Bruyne] is being checked with the doctors. So right now, we don't know. It's nothing, or it's something serious." Slavisa Jokanovic: "We showed some improvement. They showed their quality and determination. We respect the competition and we made fewer mistakes but it's not easy to play against City. "Obviously, we're not happy as we wanted to stay in the competition." Manchester City have reached the League Cup quarter-finals in consecutive seasons for the first time since 1977-78/1978-79. Fulham have lost five consecutive matches in all competitions for the first time since December 2013 (a run of 7). Man City have won their last seven meetings with Fulham in all competitions, by an aggregate score of 21-3. In all competitions, Man City have scored in each of their last 23 games against Fulham - only against Portsmouth (25 between 1963 and 2006) have they had a longer such run. Man City striker Gabriel Jesus attempted eight shots in this match, twice as many as any other player. However, just one of these efforts was on target. Diaz has been limited to minutes in just the Carabao Cup this season but he scored his first goals for the club in what was his 14th appearance and third start in all competitions. Guardiola said afterwards that he wouldn't hesitate to include the 19-year-old with greater frequency in the Premier League, but this performance will have alerted clubs around Europe. Diaz is out of contract at the end of the season, and while he was deserving of his standing ovation after two well-taken goals, the City supporters won't want to see the player leave on a free transfer if first-team opportunities continue to be limited to cup competition. But the player himself said: "You have to be patient, and when you get the chance you have to take it. It's amazing to be playing with so many great players." Manchester City host Southampton on Sunday back in the Premier League (kick-off: 3pm), while Fulham travel to face Huddersfield, live on Monday Night Football.